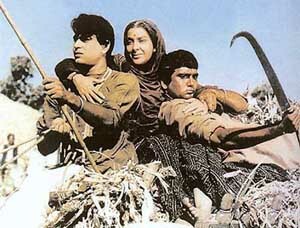 Sunil Dutt (right) in a scene from the film ‘Mother India’ with Nargis and Rajinder Kumar. Veteran actor and Union Sports Minister Sunil Dutt died in Mumbai this morning after suffering a massive heart attack. He would have been 76 on June 6. Dutt, who was suffering from a heat stroke, suffered a cardiac arrest while asleep around 11.40 am, family sources said. His actor-son Sanjay and daughters Priya and Namrata were with him when the end came. His wife, Nargis, had died of cancer in 1981. Dutt is survived by son Sanjay, daughters Namrata and Priya, sons-in-law actor Kumar Gaurav and Owen Roncon Jr and granddaughters. Dutt’s mortal remains were cremated at the Santa Cruz crematorium later this evening. Dutt’s body was brought to the crematorium draped in the National Flag in a military cortege. Those who accompanied Dutt on his final journey included several Bollywood personalities like actor-MP Govinda. The funeral cortege took nearly two hours to reach the crematorium as onlookers thronged the street to have a final look at their popular Member of Parliament. A little after 7.15 p.m., Dutt’s actor son Sanjay lit the funeral pyre. As news trickled in about Dutt’s demise, prominent personalities from Bollywood and politics flocked to his residence at Juhu in suburban Mumbai. Among the first to arrive were Bipasha Basu, Gulshan Grover, Gulzar, Mahesh Bhatt, Suniel Shetty, Amitabh, Jaya and Abhishek Bachchan, Dilip Kumar, Salman Khan, Fardeen Khan, Jackie Shroff, Javed Akhtar, Shabana Azmi, Aftab Shivdasani, Dharmendra and Bobby Deol. Some politicians, including Maharashtra Deputy Chief Minister R.R. Patil and Irrigation Minister Ajit Pawar, also arrived at his residence. A five-time Member of Parliament from the Mumbai North-West seat, Dutt had never lost an election ever since he entered the political arena in 1984 at the behest of the late Rajiv Gandhi. Dutt acquired a statesman-like image across the country when he defied death threats and undertook a padyatra across Punjab at the height of militancy. His own background as a Partition refugee helped him highlight the plight of those affected by terrorism. Born at Khurd village in Jhelum district, now in Pakistan on June 6, 1929, Sunil Dutt came to India when the subcontinent was carved in 1947. Dutt took a break from politics and did not contest the 1996 and 1998 General Election to defend son Sanjay who was among those accused of setting of bombs in Mumbai in March 1993. He returned to active politics in 1999 after his son was released on bail. He subsequently won the 1999, 2000 and 2004 elections. With the Congress turning in an impressive performance in Mumbai, Dutt was accommodated in Prime Minister Manmohan Singh’s Cabinet as Union Sports Minister. Though known as strong loyalist of the Congress, he did not mince words when the party allowed Shiv Sena rebel Sanjay Nirupam into its fold. He criticised party leaders, including party President Sonia Gandhi for letting in Nirupam who was known for his diatribe against Muslims during his tenure as Rajya Sabha MP. Just about a year before his death, Dutt returned to the silver screen for a cameo in last year’s superhit ‘Munnabhai MBBS’ starring his son Sanjay in the lead role. It was his appearance on screen in a long time ever since he featured in his own ‘Dard Ka Rishta’ in 1983 to highlight the plight of cancer victims. In Maharashtra politics, Dutt was known for his opposition to Nationalist Congress Party chief Sharad Pawar ever since Sanjay Dutt was arrested in the March 1993 serial bomb blasts case as Dutt felt that Pawar, who was Maharashtra’s Chief Minister at that time, did not do enough to bail out his son. Finally, it was Shiv Sena chief Bal Thackeray who came in support of Sanjay Dutt. During his short tenure as minister, Dutt was known to take up the cause of sportspersons. He is credited with several programmes to improve the standard of Indian athletes. Dutt, who has extensively campaigned for the Congress in the recent past, had several brushes with death. He survived two aircrashes that left several of his co-passengers seriously injured. Rich tributes for Sunil Dutt poured in from colleagues and party rivals alike. Bharatiya Janata Party General Secretary Pramod Mahajan described Dutt as “a hero not only on screen but also off screen” for his dedicated work for the poor and downtrodden. BJP leader in the Maharashtra Assembly Gopinath Munde said the 2,000-km peace march for communal harmony, which was organised by Dutt at the height of militancy in Punjab, was an example of social and inter-religious harmony. “He was a rare human being. People like him are difficult to find,” said Lata Mangeshkar. Recollecting her association with Dutt, Lata said he could play different roles with ease. “If he was successful in politics, it was due to his hard work,” she said. “I can’t believe that Dutt Sahib is no longer with us. It comes as such a deep shock not just to those who work in the film industry but also to the people of the country,” said actress Shabana Azmi. “Dutt was the first among many others who worked outside the film industry to bring succour to so many people. I feel bereaved on behalf of all people he had lived and worked for,” she added. “The news of Dutt’s death has come as thunderbolt to me. How could a person, who was so full of life, die all of a sudden? This is so unbelievable,” lyricist Javed Akhtar said. The President, the Vice-President and the Prime Minister today led the nation in condoling the death of versatile actor and Union Sports Minister Sunil Dutt. “Kindly accept my heartfelt condolences and convey them to the rest of the members of your family,” he said in the message to Sanjay from St Petersburg. Vice-President Bhairon Singh Shekhawat described him as a “champion of peace and brotherhood”, and said Dutt was a multi-faceted personality who excelled in every field. NDA leaders said Dutt’s demise was a great loss for both Parliament and the world of cinema. “He was a great actor, I was a great fan of his. Even in Parliament his behaviour was very docile,” JD (U) leader Nitish Kumar said. “Sunil Dutt was not only a great actor but had also made a place for himself in public life. He was respected by all parties,” BJP General Secretary Arun Jaitley said. Defence Minister Pranab Mukherjee said Dutt’s untimely death has “snatched away a great son of India who has made distinctive and signal contributions in enriching national life in several sectors”. External Affairs Minister K Natwar Singh said he was stunned by his sudden death. “He was one of God’s great gifts to humanity. He was undoubtedly a great actor — he was much more than that — a compassionate human being, a spirited minister, a magnanimous performer,” he added. The Star Parivaar Awards — Star Plus’ ode to its brightest TV stars — which was scheduled for today (May 25), has been postponed due to the demise of Bollywood actor and Union Minister for Sports and Youth Affairs Sunil Dutt, a statement said here today. Star India, as a mark of respect to Dutt, has decided to reschedule the ground event to later this week.